Any semi-fans of 'The Simpsons' out there? I have eleven themed DVDs to give away. No covers. No boxes. Stamped 'Not for Sale'. Email me your address and I'll send them to you. One set only, first in first served. Australia only. Oh, and why did I say 'semi-fans'? Because real fans already own all the episodes! UPDATE (Thursday, 20 November 2008, 9:27 am): Well, these have gone already to Michael in Canberra. I've got a few other bits and pieces that I'll be giving away from here over the next few weeks, so stay tuned. The Getaway $29.95 December 2008 - I didn't realise that this was a Sam Peckinpah movie. And I have never ever watched it. I'm ashamed! Led Zeppelin $29.95 December 2008 - Not sure what this one is ... the movie? the live performance compilation? something else? Blade Runner 5-disc $99.95 December 2008 - I already have this one from the US. The best package of extras ever. 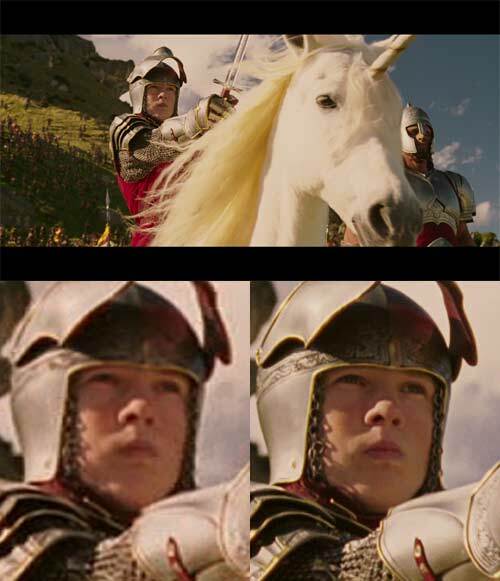 Three released versions of the movie, including the 'Final Cut' which is how Ridley Scott wanted it seen in the first place. Fully restored, and gorgeous to look at. From memory, two of the discs are DVDs, while the other three a BDs. V for Vendetta $29.95 This price from 3 to 24 December 2008 - Includes BonusView PIP feature, just like the HD DVD version. Blade Runner 2-disc Special Edition $29.95 This price from 3 to 24 December 2008 - includes the definitive 'Final Cut' version of the movie, and a major making-of doco. Flags of our Fathers $29.95 This price from 3 to 24 December 2008 - Yes!! Letters from Iwo Jima $29.95 This price from 3 to 24 December 2008 - Yes!! The Prestige $29.95 This price from 3 to 24 December 2008 - Yes!! The Assassination of Jesse James by the Coward Robert Ford $29.95 This price from 3 to 24 December 2008 - Yes!! One Flew Over the Cuckoo's Nest $29.95 This price from 3 to 24 December 2008 - Yes!! Natural Born Killers $29.95 This price from 3 to 24 December 2008 - Yes!! This is just sad. 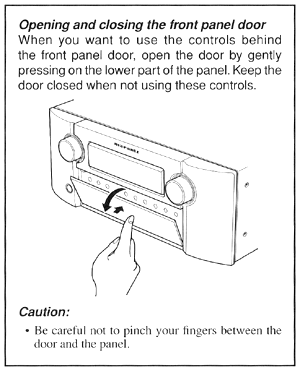 This comes from page 3 of the manual of the Marantz AV8003 home theatre preamplifier/tuner. This is a wonder of technology and high-end performance that costs $4,499. Yet it has to have a notice in the manual warning you not to pinch your friggin' fingers! I'm not blaming Marantz here. I'm blaming a legal system that ends up with people having to waste time on such silliness as this. The full list, along with the rest of my Blu-ray and HD DVD reviews, is here. There are 32 reviews and 15 comparisons. I do add more from time to time. Indeed, there are four more reviews I will be adding in next few days, and comparisons for a couple of them. I usually do five or six comparison shots in the comparisons. A couple of months ago Sony Computer Entertainment kindly loaned to me a Sony PS3 for use as a Blu-ray player. I sought this so that I could explore the new advanced features of Blu-ray: BonusView PIP material and BD-Live Internet content. At the time, the PS3 was the only Blu-ray player available which supported BD-Live. In many ways it remains the best, simply because its industrial strength processor makes it do things much faster than other Blu-ray players. In addition to playing Blu-ray discs, the unit also plays DVDs, CDs and games. Plus it acts as a media player for music, movies and photos on the connected network. It was in playing back music over the network that some odd behaviour was revealed. In short, when used to play stereo music (eg. MP3) retrieved from my computer over the network, or MP3, ATRAC or AAC files held on its own hard disk, it delivered the audio over HDMI to my home theatre receiver in the form of 7.1 channel PCM, with the sampling frequency changed from its native 44.1kHz to 48kHz. While exploring this, I discovered that when playing a CD it delivered the audio in the form of 5.1 channel PCM, upsampled to 176.4kHz (ie: 4x original sample rate). In both cases, the extra channels are 'empty', in that they contain no musical content. All the sound is actually delivered in the front left and right channels. The major problem with this is that the receiver can't apply any of its nifty surround processing routines to 5.1 or 7.1 sound, only to stereo. I queried Sony and they suggested switching off most of the digital audio standards in the 'Audio Output Settings'. Thus started a process of discovery, the outcome of which I summarise here. First, let us deal with CDs. The process is far from intuitive. In essense, to reduce the output from 5.1 to 2 channel PCM the easiest way it to ... lower the sampling frequency! press 'X' again to save the settings. This will cause CDs to be played over HDMI in two channel PCM at 88.2kHz. If you would prefer the original CD Audio sound to be output, then also deselect 'Linear PCM 2 Ch. 88.2kHz'. This will allow the sound to be delivered in a completely pure 44.1kHz format, as held on the disc. I recommend this setting because in addition to avoiding unnecessary processing, it allows DTS CDs to be played because the pure audio stream is delivered to the receiver which can decode it into DTS. Why switching off 176.4kHz would disable the 5.1 channel conversion is a mystery to me. It smacks of something an engineer might have slipped in to allow himself to test things. Unfortunately, none of this applies to the MP3 playback over the network, nor to music ripped to the PS3's internal hard disk drive. I've tested it with MP3 and ATRAC. To recap: MP3 music, played back from the network or from the internal hard disk, using a HDMI connection to a modern home theatre receiver, is delivered as 7.1 channel PCM, upsampled to 48kHz. The sound is contained only in the front left and right channels. The other 5.1 channels (centre, surround left and right, surround back left and right, and subwoofer) are all empty, carrying only silence. The upsampling to 48kHz (from the 44.1kHz of the MP3) is of minor import, irritating primarily to the purists (like me) who object to such totally unnecessary processing. However the wrapping of two channel sound into extra unnecessary channels has significant implications. The primary one is that with most home theatre receivers it eliminates the ability to apply most of the receiver's surround processing options, such as Dolby Pro Logic IIx or the various DSP sound fields, since these will only work on two channel sound. There are two rather clunky work-arounds. Follow the process shown above, but when you get to the fifth dot point, go through and deselect everything except the basic two channel modes. This will force the sound to be delivered in two channels. Unfortunately, you then have to go and re-enable those multichannel settings to fully enjoy high definition sound (DTS-HD Master Audio and Dolby TrueHD) from Blu-ray discs. The other is to connect an optical audio cable in parallel. Then, whenever you want to play MP3, ATRAC, AAC or WMA tracks from the unit or the network, you go to Settings on the PS3's XMB, select 'Audio Output Settings', then 'Digital Out (Optical)'. Of course you will need to change the audio input of the home theatre receiver from HDMI to Optical. Some allow both inputs to be connected at once, such as my Yamaha. My receiver is clever enough to switch to HDMI if there is an audio signal coming from it, and then back down to Optical if not, and fall back on Analogue if there is no optical signal either. Unfortunately, the PS3 messes this up as well because when the output is set to optical, it still outputs two silent 48kHz PCM tracks down the HDMI connection, so tricking the receiver into thinking that there is HDMI sound and negating its auto input switching function. Still, I can manually switch that with my receiver. However, after using the optical output, when it is time to go back to HDMI sound for Blu-ray, you find that any custom settings you have made in its output have been lost. Since the unit adds nothing to the extra channels it generates, it would be best if the unit defaulted to a kind of 'native' output for all CD, MP3, AAC, WMA and ATRAC music. I have had a note back from the Tokyo based engineering team. They were appreciative of the feedback and wanted to let you know that they are attempting to address the matters you have raised. They hope to be able to provide a fix in a future system software upgrade. The other day Samsung made available a Version 2 firmware for its BD-P1500 Blu-ray player. As delivered the player was BonusView (ie. PIP) capable, and 'BD-Live ready'. That is, it had the hardware for BD-Live (principally, the ability to access Web-enabled content). But not the firmware. The new firmware delivers on that promise. Two minutes ago I checked, and it is not yet available in Australia. But I can't imagine it will be very far away. When it does become available, this may well displace the Sony BDP-S350 as the fully functional Blu-ray player price leader, seeing as how my brother purchased one a couple of weeks ago for just $350. UPDATE (Monday, 13 October 2008, 4:17 pm): So how much does the Samsung BD-P1500 cost anyway? Last month I was told its recommended retail price was $699. With the launch of the low cost Sony units, I thought that Samsung might respond with a price reduction. It apparently did since, as I mention above, my brother purchased one at a regular discount retailer for $350. So I've tried twice in the last week to find out the current RRP. On both occasions my regular contact hasn't answered his phones, so I've resorted to the Samsung help line and asked there. They always maintain this information. On both occasions, though, after looking up their price lists they were unable to find a price. Odd. On the second occasion, the helpful operator went in search of an answer, and the one she was advised to deliver was that as the BD-P1500 is a replacement for the BD-P1400, it is the same price: $769. Somehow I don't think the price has gone up. UPDATE 2 (Tuesday, 14 October 2008, 10:19 pm): Samsung's PR firm advises me that the RRP of the BD-P1500 is $499. Now, that's more like it! I hope to have info soon on the BD-Live upgrade. I want to test it out ... and also see if the USB memory stick containing my BD-Live stuff from the Sony BDP-S550 will work on a different brand player. Well, that explains things. A couple of posts ago I mentioned that US watchers of Iron Man on Blu-ray were having their Playstation 3s seize up on loading the disc. No wonder. It seems that the Blu-ray version of this disc sold 260,000 copies on the very first day (and half a million in the first week). Presumably the Internet site to which it linked was initially overloaded. The report also mentions that compared to the 500,000 Blu-ray discs of this movie sold in the first week, 7.2 million DVDs were sold. That's an impressive result ... for Blu-ray. Some seven per cent of sales were Blu-ray. Okay, that proportion is probably biased since enthusiasts probably also tend to be early adopters of technology. Nonetheless, it does give cause for hope that Blu-ray is succeeding, and will be a format here to stay.